In the next few posts I'm going to review some of my favorite mapping and GPS apps for mobile devices. GPS apps can be great for providing turn by turn directions on your route, but are often not so good for getting a big-picture view of where you are and where you are going. Fortunately there are some great mapping apps out there to give you the big-picture view. 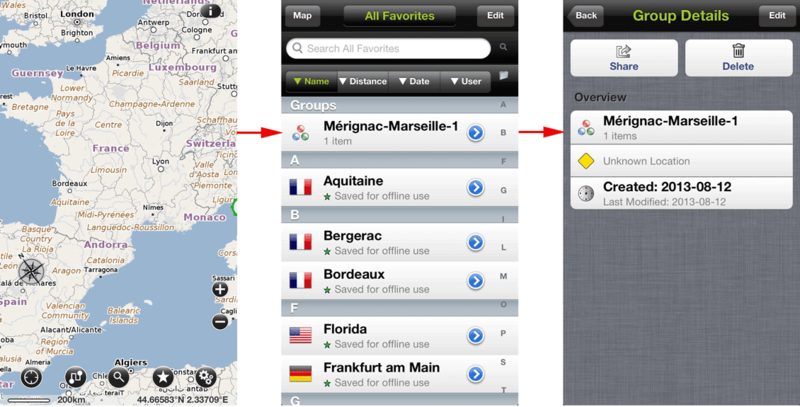 In both cases it's easy to download your route from MyCycleTour to these apps so you can navigate with ease. In this post I'm going to focus on my favorite big-picture mapping application. I trip overseas quite often and don't appreciate the crazy prices charged by my mobile carrier for data roaming - so I looked for a mapping app that supports off-line content so the maps are actually on the device, not downloaded as you view them. My favourite app for my IOS devices (iPhone/iPad) is Pocket Earth and that's what I'll focus on this time. Unfortunately this app is not supported on Android devices, but we'll look at alternatives for Android later. Once you have the app you then need to pre-load the area maps of where you are going while you have data connectivity at home. Under "settings" go to the help menu and look at "Downloads". Click on the country or region you will be cycling in and tap the star icon to download the area (adds to your favorites). Repeat this to cover the area that you will be cycling. Once loaded you can see the map detail regardless of data connectivity, but I highly recommend you test this by turning off your device data and restart the app. Display the route that you want to download in MyCycleTour (e.g. select from the home page, from MyRoutes etc.). 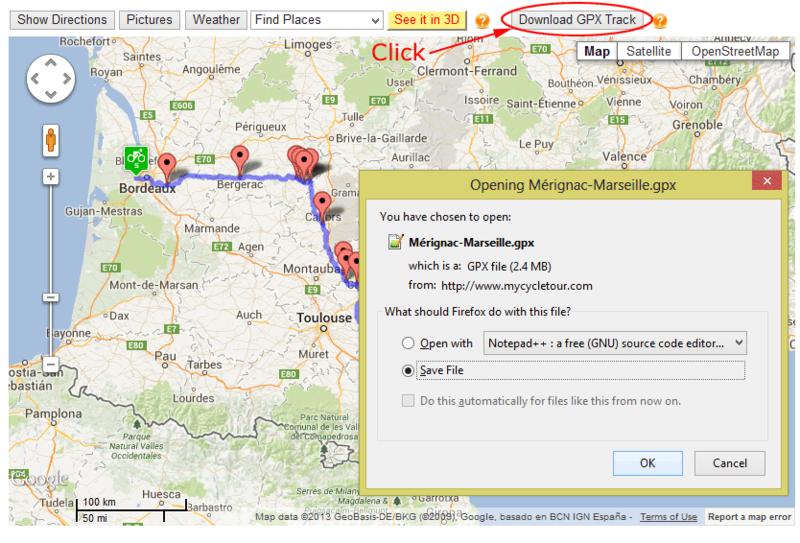 Above the map click on "Download GPX Track" and save the file to your desktop. 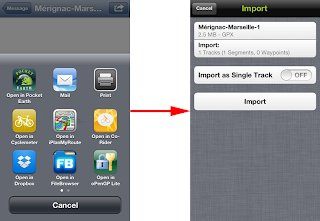 To get the GPX file to your iPhone or iPad you can email it to yourself or, if you have Dropbox, you can also save the file there. 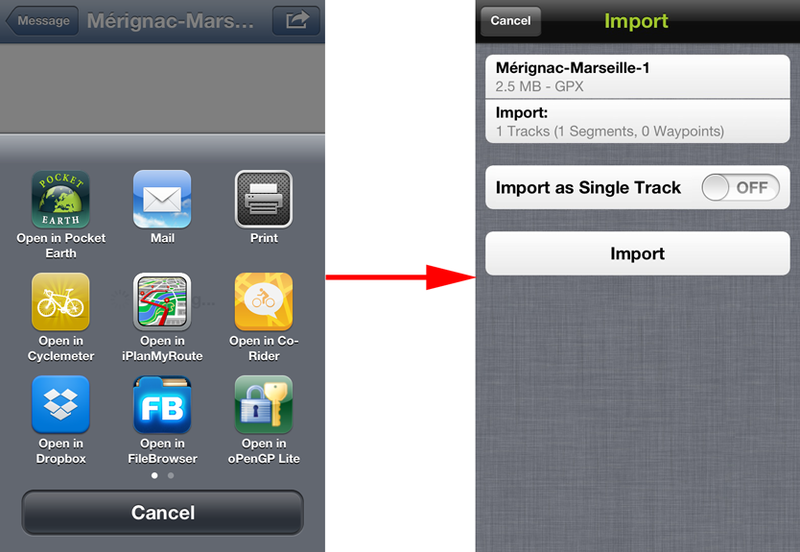 (In future you may be able to email it directly from the Download GPX options box in MyCycleTour). 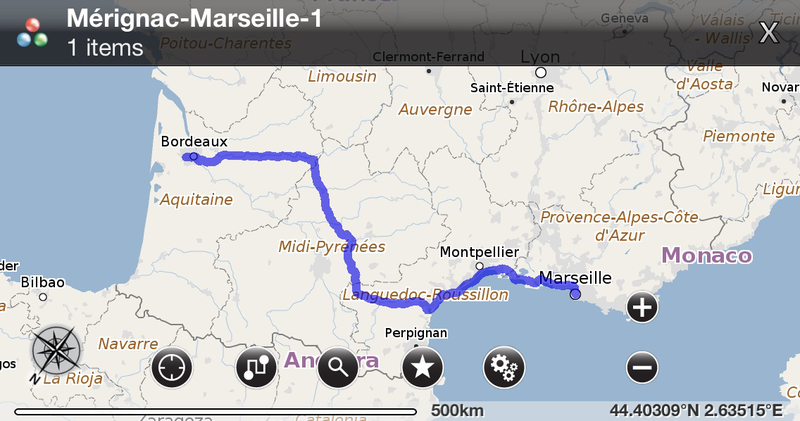 In this example I have chosen the route at: http://www.mycycletour.com/displayroute.php?RouteNumber=79. Open the file from your Email program or from Dropbox on your iPhone or iPad - it may open in a default app or it may ask you to choose an app. Select the "Open With" (top right of left image below) icon as shown below - then open it in Pocket Earth (click on the Pocket Earth icon below left). This will open the image on the lower right. Select "Import". You now have the route in Pocket Earth. To display it simply go to your favorites by clicking on the Star at the bottom of the map (left image below at the bottom). Select your route from the middle screen, and again on the right screen. The route will now be displayed on the Pocket Earth map. From here you can zoom in to street level, and can enable the GPS find me capability of the map (lower left button). Get familiar with Pocket Earth using their Help menu. As you ride you can open this app and have it locate you using GPS, then compare to the route downloaded from MyCycleTour. While this app has GPS, it does not provide turn-by-turn directions (we'll check that out in a later post). This app does, however, provide a great way to see the big-picture, and to track your location and progress relative to your route - without burning up data minutes on your mobile device. I guess it works only on Apple devices. How about Android tablets? Is there a way to use MyCycleTour routes on them? Pocket Earth only seems to be available for IOS (Apple) devices. If you look at the October blog here you'll see a write up on OsmAnd. OsmAnd (Open Street Maps Automated Navigation Directions) runs on Android and Blackberry, but not on IOS. It allows downloading the OSM maps for free, and can be used as both a map and a navigation device with spoken directions. 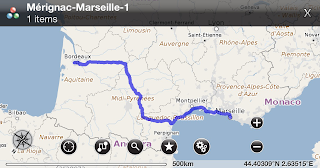 On a trip last year in France my friend used this app, and loaded our route from MyCycleTour (as a GPX file) and it worked perfectly. I hope this helps - if not, send another reply.